Pixi Skin Treats — Worth The Hype? So at the end of last year I finally gave in and went to the Marks and Spencer Pixi stand to see what the fuss was all about. I’d been wanting to try the Glow Tonic for ages (it does have cult status, after all) but I also needed a new cleanser for my second cleanse in the evenings — I couldn’t resist grabbing the Glow Mud Cleanser as well. I’ve been using both products for about three months now, so it was about time for a review! Over the past few months my acne has been steadily improving, and while this is mainly because of my prescription cream I do think these products have helped to speed up the healing process. Packaging: Cute pastel green. The gold lettering rubs off, which is not something I’d expect from a product that costs £18. Consistency: It’s a bit like a silkier clay mask, if that makes sense? It looks like a clay mask, too. Despite the thick texture, it’s very easy to work into skin. I usually rinse it off with a flannel. How often do you use it? Once a day, in the evenings, after I’ve removed my make-up with Ultrabland (my favourite Lush cleanser). Results: My skin always feels cleaner and looks brighter after I use this, without that horrible tight feeling that you can sometimes get when your cleanser is too harsh. Thankfully, the acids don’t cause any irritation. I really enjoy using the Glow Mud Cleanser and I’d definitely repurchase (only if I could afford it, though! £18 is a little more than I would normally pay for a cleanser but I had some Christmas money and was feeling spendy. We’ve all been there). Packaging: A plastic bottle with the classic green pastel lid and the Pixi logo. Ingredients: Aloe vera, ginseng, 5% glycolic acid. Alcohol free. Consistency: It’s your standard liquid toner. How often do you use it? Once a day, in the evenings, after my second cleanse. I apply some to a cotton pad and wipe it over my skin. Results: It’s not always easy to tell how well something is working when you’re using it every day, but there have been a couple of times when I’ve forgotten (late nights!) and that’s when I noticed how much Glow Tonic had helped — my skin is always much smoother when I’ve used it the night before and I think it helps to calm down my spots, too. I can see why Glow Tonic is hyped up so much! I can see why Pixi gets so much love from bloggers — these products really have worked for me! 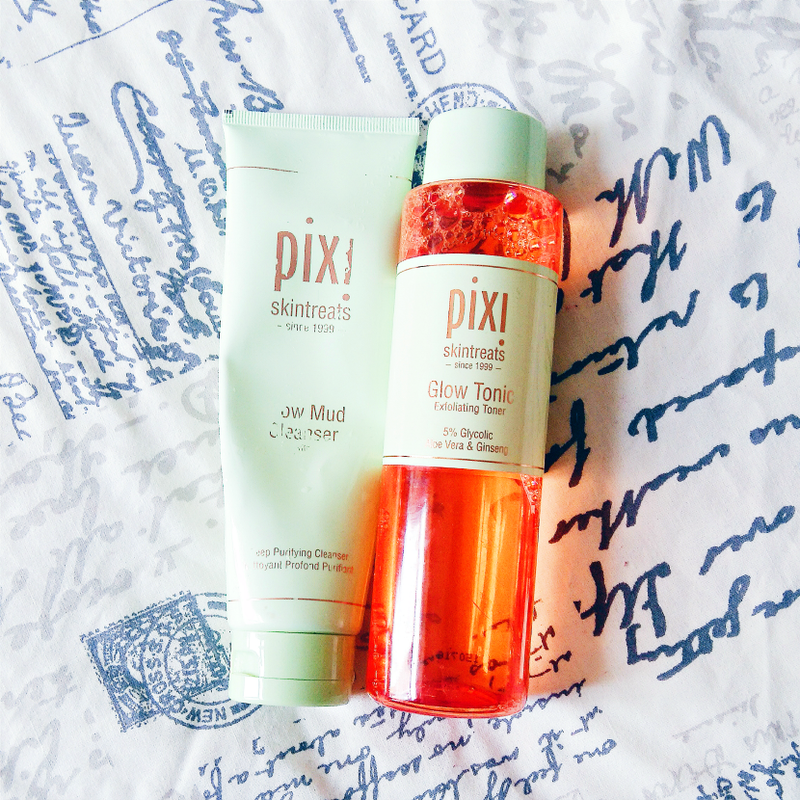 Have you ever tried anything from Pixi‘s skincare range before? What did you think? Let me know in the comments!